Mexican Catholics are outraged over a floor-length dress adorned with crosses and scapulars as well as images of the executions of 1920s Cristero martyrs that the country's Miss Universe contestant had planned to wear ... 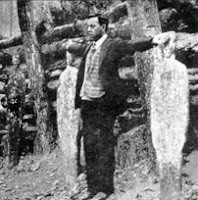 The floor-length dress is accented with crosses, scapulars and a sketch of a man facing a firing squad. Designers who helped select the dress from among 30 entries argued it represented the nation's culture and history, especially since Mexico City is hosting the pageant in May. posted by TG @ 11:03 p.m.